For four days, 900 young professionals competed in 75 professions for the Swiss professional championship titles. 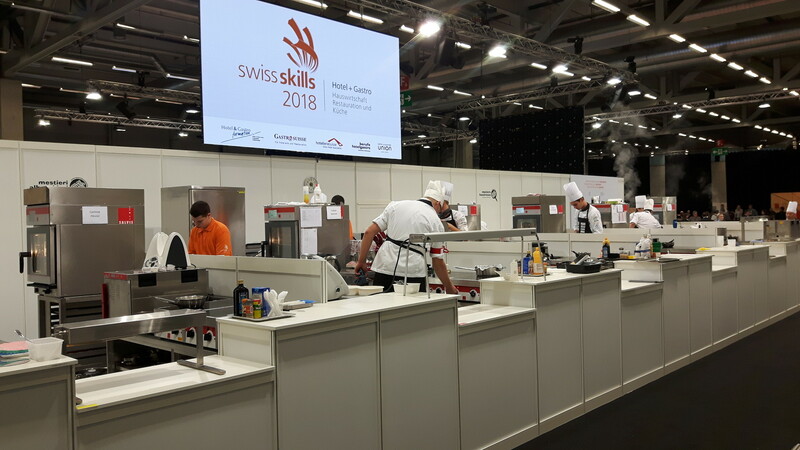 The arena for the kousekeeping, restaurant and kitchen competitions was coordinated and implemented by the Hotel & Gastro formation Switzerland. Project manager SwissSkills and WorldSkills Jean-Claude Schmocker is delighted: "We were warmly welcomed by the city of Berne and received a great infrastructure". He experienced the candidates as motivated, talented and extremely fair. "We have great young talents. They can show the world what they have learned and the passion with which they go about their daily work. Jean-Claude Schmocker also says this with a view to WorldSkills. The Hotel & Gastro formation Switzerland was looking not only for Swiss champions, but also for potential world champions. The WorldSkills will take place in Kazan in Russia in 2019. Martin Amstutz (kitchen) and Martina Wick (restaurant) will represent Switzerland there. The young cooks were able to get advice from their coaches the evening before and ordered the desired ingredients. On the final day they presented the menu and at the same time received squid as a mistery component. In addition, they had to create a black box dish within 45 minutes before the dessert. Martin Amstutz from Sachseln has solved all the tasks best and is thus the Swiss Champion 2018 Kitchen. "It's an indescribable feeling. It's really incredible that I'm Swiss Champion. I am overwhelmed," said the 20-year-old from Obwalden shortly after the award ceremony. For Daniel Inauen, head expert in cuisine, it was the SkissSkills with the highest level. "All the candidates were very well prepared and worthy to take part in these professional championships. Inauen also praised the entire organisation and was pleased with the good atmosphere in the team. The kitchen infrastructure for the 6 competition kitchens were provided by Salvis. They each consisted of a mobile thermal cooking unit Salvis Smartline ceran and induction, a combi steamer Salvis Cucina 611T with only 55cm width as well as a neutral and a refrigerated working unit. The well-known Salamander classic Pro was perfect for over crusting the garnishes. We wish all participants much success on their further journey!